Gifts from me to you! The Quilted Santa's gifts for YOU! Thank you for the opportunity to win. Happy Holidays! I love the changes to the blog….making it seem like it is snowing….very nice touch! Your opportunity to obtain gifts during a drawing is very kind of you. Any gift from Primitive Gatherings would be well received. My Favorite recipe for Christmas is just to mix all my family together in one home together. Merry Christmas to you and your family Lisa. Here is a great bean dip recipe for you. 1 block of hot pepper jack cheese, add half the block in & check consistency then add the rest as needed. Make sure you cut in small pieces before you add it, some pepper jack does not melt very easily. Put all in a slow cooker on high until it starts to bubble up, then turn to low & let simmer for a couple of hours or more. An hour or so before serving, add in 1 or 2 packages shredded cheddar cheese and some bacon bits, the final results should be a dip that will hold a chip upright and has a great taste with a bit of heat. Evne if there weren’t wonderful gifts, I am happy to share a tried and true recipe for the holidays. Make it ahead and heat before serving. YUMMO! Marry Christmas! Cook lasagna noodles, drain and set aside. Melt ½ stick stick butter and sauté onions. Mix onions with prepared mashed potatoes. Put a layer of noodles in the greased pan. Spread a layer of mashed potatoes. Sprinkle with part of the grated cheddar cheese. Continue until you have at least 3 layers. End with cheese on top. Cover pan with foil and bakd 30-40 minutes. Fun!! How wonderful of you! Merry Christmas to you, your family and your staff and their families!! Sift dry ingredients together. Add egg, butter, and orange juice. Mix til dry ingredients are moistened. Fold in nuts, cranberries, and rind. Pour into a 9×4-1/2×2 loaf pan. Bake 1 hour at 325. What a great idea, and you are so generous. My favorite Christmas recipe is for the peanut blossom cookies with the hershey kisses. The kids love to pick off the chocolate first and the adults try to eat a little chocolate with each bite. In any event, they are good and it’s a bit entertaining to watch everyone enjoy them. I like to try the different flavors of kisses but usually stick with the chocolate. Merry Christmas to you! I melt butter in 13 X 9 pan in oven while it is warming up. Then sprinkle the Graham cracker over melted butter in pan and press down with spoon to even out the crumbs. Pouring sweetened condensed milk over cracker crumbs. Layer other remaining ingredients and press down with spoon. Bake at 350 degree for 25 minutes. Cool before cutting and store at room temperature. One of my favorite salads to make and bring to gatherings during the holiday season is a Cranberry Jello Salad. It is festive, and easy to make the day before. Merry Christmas to everyone at Primitive Gatherings! Dissolve Jello in boiling water. While water is still hot, stir in the undrained crushed pineapple and cranberry sauce. Chill Jello mixture until partially set. Use a small amount of Canola Oil to grease the inside of a ring set, then spoon half of the mixture into the ring set and chill until set. Keep remainder of mixture out at room temperature. Stir sour cream and spread on top of set Jello in the ring. Spoon remainder of Jello mixture on top of sour cream layer. Happy Holidays to Lisa and the staff at Primitive Gatherings! Recommend you double the batch – these are tasty! Grandma E use to make when we were little. AZ friend entered them in a cookie contest and won first prize. Lisa-Merry Christmas to you and your family, thanks for sharing. Love your give away!! This is a recipe that will WOW your guests!! And SO easy!! Mix and press into a spring form pan or cake pan. Save some crumbs to sprinkle on top. Melt marshmallows with milk in microwave. Cool. Whip cream till stiff. Whip marshmallow mixture and add cream de mente. Fold into whipped cream. Spread over Chocolate crust and sprinkle with reserved crumbs. I like to drizzle Smuckers hot sundae sauce on top just before serving…just because I can!! :o) Put in fridge until set (you can freeze until ready to use…thaw) You’re guests are going to love it!! Thanks for the chance to win your give away!! Take care and have a wonderful Christmas…and I will be seeing you in the New Year at the Road to California!! Can’t wait! Love your blog and all your projects. Just wish I had time to do more of your patterns. Have a lovely Christmas with your family. Have really enjoyed your weblog just about everyday and all your pictures. Sure wish we lived closer to your store. An easy cookie recipe that you can do lots of different things with. Combine together and then form balls and roll in sugar or sprinkles and bake. Form logs and dip an end in chocolate after baking, Form balls and then put thumbprint in middle to put jam, jelly or colored frosting in indention after baking. The list goes on and on. Bake at 350 for 10-12 minutes. Absolutely love your shop. Unfortunately, I live pretty far away (East Troy) but make at least 2 trips a year to visit and never go home empty handed. I will miss the Rosemont Quilt show but will get to see you at Madison. Thank goodness for your website, which I visit daily. Spread it on top, hardens quickly. Love your Weblog! We are coming to The Gathering in February, looking forward to it. Well, Lisa, what a nice, Christmasy thing to do ! Add dry ingredients to the creamed mixture. Refrigerate overnite. Take a teaspoon of dough, insert a chocolate mint wafer in the middle, and cover up with dough. Place a pecan half on top, put on a greased cookie sheet, bake 10 – 12 minutes in a 350 degree oven. If you can’t find a chocolate mint wafer, you can use an Andes chocolate mint…. Roll out to desired thinness and bake at 375 degrees. Can add extra yolk or nutmeg as variation. Oh I’d love to win a prize! Our favorite cookies are the Neiman Marcus chocolate chip cookies. Just google them and you’ll find the recipe. They’re wonderful! Thanks for the chance to win! Hi Lisa. Happy Holiday’s!! My favorite no frills recipe is for Raindeer poop. Round pretzels, topped with a chocolate kiss, heated in 225 degree oven for 2-3 minutes and removed from oven. Top with a plain m&m and pressed down. Adjust time in oven as necessary. Fun to do with grandkids!! The tough part can be finding the round pretzels? Lisa, love seeing and shopping your booth in Houston every year. A really quick and cute dessert is lollypop pies. You can Google them, but basically you use a cookie cutter to cut circles from homemade or ready made pie crust. Place one circledown on a cookie sheet (you can flour it or your hands!) and spoon your fav pie filling in the center, leavine room to crimp the edges. Put a lollypop stick inside and cover with another pie cirle, and crimp the edges. Brush with egg white only. Bake according to your oven’s mood, as mine in tempermental lol. Keep checking, as with cookies! OMGosh! It definitely feels like Christmas now. I saw all those goodies and felt a little faint…….grin. Here’s my favorite recipe from my Mom who just turned 90 today….enjoy. Combine sugar, peanut butter, karo, and milk in sauce pan and Mix. and add butter and vanilla. (about 20 minutes if your lucky). Turn out on a buttered plate, cool, cut, and eat it ALLLLL! I cook pretty plain and simple. Ham/Turkey etc. Baking is pretty much the same. I use an apple cook book but I think it is out of print. I enjoy baking snickerdoodles and millionaire shortbread. Both are easy and well loved. Have a Merry Christmas with your family. Your blog is one of my favorites! I visited Primitive Gatherings about six years ago on a bus trip with my guild. You were so generous, we all got a wool snowman pin cushion kit. Wish you were closer. Jennifer NW Indiana. Here is an easy cookie recipe. Mix together and put in paper lined miniature tin cups. I love receiving your weblog and I adore your store. You have the best of everything! order from the website and see your booth at the shows. I see your wool kits all over the place at other stores, they seem to be really popular!! Thanks for having an enjoyable, quality shop. I just made a second batch of pineapple fudge, one of four kinds of fudge this year. The pineapple is different from all the chocolate; it’s white. I’ll send the recipe if you want! My favorite Christmas cookie are Spritz!! I love spiral ham!! I love all the appetizers that my family puts out!! I love your website and your blog!! I look at your blog every day and cannot wait to start using my coupon book January 1st! Merry Christmas Lisa!! I love making spritz cookies with my Mom’s (now antique) cookie gun and decorating them with colored sugar. One of my favorite childhood memories is of Mom making Divinity candy. Had to be a cold dry day and she’d stir it on the stove til it got to the right temperature, then run outside and beat it by hand until it was the right texture. Then back in the house for us to help spoon it out onto waxed paper as quick as we could! Merry Christmas to you and your family. In a 9 x 13 pan melt butter in a 325 degree oven. Beat egg whites til frothy and add sugar slowly til thick. Remove pan from oven and toss nuts in egg mixture. Put in pan and flatten with spatula and bake 10 min. Toss nuts and bake 10 more min. and repeat for a total cooking time of 30 min. Cool, toss and loosen from pan and enjoy! Love your patterns and website! Wishing you many Christmas blessings! 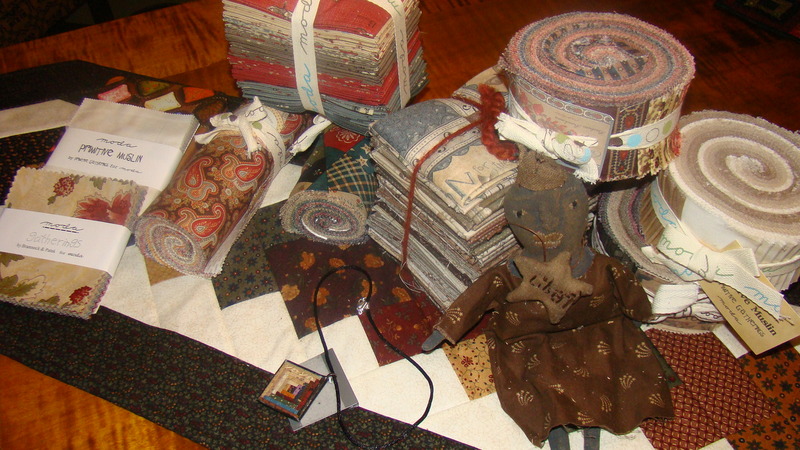 Love reading your blog and seeing pics of the quilts you make. Recently made two small quilts using your primitive pinwheel ruler. Can’t wait to get my hands on the smaller one you are designing or maybe it is already out. Below is a recipe that I had at my bees Christmas luncheon. It was so yummy, taste like a dessert. Enjoy! Thanks for the great giveaways! Cream the cheese, butter and vanilla together. Add the sugars and cream again. May want to divide into two balls before rolling in chopped pecans. Lisa…I’m one of your faithful followers and I wanted to share this easy and quick recipe for Truffles. They are dark, rich and chocolaty! I always make these for Christmas and everyone thinks I’m an expert candy maker! In a microwave-safe bowl, melt chocolate chips; stir until smooth. Add the cream cheese, coffee and water. Chill until firm enough to shape. Shape into 1-in. balls and place on waxed paper-lined baking sheet. Chill for 1-2 hours or until firm. In a microwave, melt chocolate coating; stir until smooth. Dip balls in chocolate; allow excess to drip off. Place on waxed paper; let stand until set. Melt white coating and drizzle over truffles if desired. Yield: about 5-1/2 dozen. Editor’s Note: Dark, white or milk chocolate confectionery coating is found in the baking section of most grocery stores. It is sometime labeled “almond bark” or “candy coating” and is often sold in bulk packages (1 to 1-1/2 pounds). It is the product used for dipping chocolate. A substitute for 6 ounces chocolate coating would be 1 cup (6 ounces) semisweet, dark or white chocolate chips and 1 tablespoon shortening melted together. Truffles can be frozen for several months before dipping in chocolate. Thaw in the refrigerator before dipping. Do not dip if the balls are cold as the coating will crack. This recipe is from Taste of Home. I have too many favorite recipes, but here’s an oldie, but a goody I will share. My Mom made these chocolates every Christmas and I haven’t for awhile, but decided to this year and I’m so glad I did. Everyone seems to love them. I hope you and your readers do too! Mix together butter, coconut, nuts and Condensed milk, then mix in powdered sugar. Cover and refrigerate overnight. Scoop or shape into 1 inch balls. (I use a 1″ diameter cookie scoop). Melt candy melts in the microwave about a cup at a time in a shallow bowl. Dip chocolates using a fork and place on parchment until firm. (They firm up quickly.) Store in a closed container in a cool place. My garage is super cold, so I have a nice cupboard where I can keep the Christmas candies til serving or sharing with friends and neighbors. What a fun post!! (I actually grew up in East Troy, where Lori said that she lives!) I finally had a chance to visit your shop last fall when I was visiting for a few days. It’s a good thing that you aren’t in my backyard!! My favorite cookies at Christmas are peanut butter blossoms. Unfortunately, I don’t have the recipe because my mom always makes a few for me! And those pecan shortbread balls, that are dusted in powdered sugar, only to show evidence on your black outfit, aren’t bad either! this is the Christmas coffee cake that gets rave reviews everywhere it goes! It also freezes well without the glaze! Best if eaten the day after it is made as it needs time to mellow. Cream margarine and sugar. Add eggs singly, beating after each one. Mix dry ingredients and add alternately with sour cream. Add almond extract. Grease tube pan. Put layer of batter on bottom, then swirl in ½ can cranberry sauce. Sprinkle with a few nuts. Repeat. Sprinkle with nuts. Bake 350 degrees for 55 minutes. Cool 5 minutes and then turn out onto pan. Drizzle with glaze when well cooled. I do a finger food buffet for Christmas Day. It is the tradition that was started a few years ago when my parents stopped having it at their home. My sons and families, both sets of parents, and other friends and family are welcome to stop by whenever they wish during the day and food is always available for them. Do a couple of hot dishes…the grape jelly and chili sauce meatballs, and my kielbasa recipe which is as follows…..
1/3 cup sugar, 1/2 cup brown sugar, 2 tbsp. mustard, 2 tbsp. cornstarch, 1/2 cup white vinegar, 1/4 white karo syrup, 8 oz. cranberry sauce. Heat and stir til well blended and simmer for an hr; then add 2lbs. of slice kielbasa and place in a crockpot or slow cooker for a couple hrs. Thank you for this lovely giveaway…I will take any of them!! I love your website and blog. Will miss not seeing you at the Chicago quilt show. My Christmas dinner will be spiral ham, cheesy potatoes, ribbon jello and whatever else I can think of. I love the basic…toll house and chocolate krinkle cookies. But I look forward to trying some new recipes from the Home for the Holidays Blog Hop! Wish I was closer to visit your store (Chesapeake,VA), but for now will continue to enjoy you blog and shop on line. Merry Christmas! Like others I have to visit your blog and see you at quilt shows since I live far away. But getting to your shop and to the Retreat is on the top of my “to-do” list. Favorite cookie is the pecan tassies. Drain the pineapple and mix all the fruits together. You can add chopped walnuts if you like. My husband and kids eat this as a topping for ice cream, too. Thanks for the gifts. Even if I don’t win, it’s gracious of you to have the draw! Happy Holidays. Two great salad favorites to share with others. One is from a long time ago and still a family favorite and the other one somewhat new but still yummy! Mix and pat into 9 x 13 pan. Bake at 325 for 10 minutes and cool. 8 oz cream cheese and 1 cup sugar. Add 1 cup cool whip and spread over cooled crust. 2- 10 oz pkg frozen strawberries. Mix all together and allow to cool and thicken slightly. Pour over other 2 layers and refrigerate. Enjoy! New recipe and just as yummy! blend together 6 oz of cream chees and 3/4 cup sugar. freeze in 9 x 13 pan. Take out of freezer 1/2 hour before serving! My favorite Christmas cookie are Spritzs. Simple and always a hit. Merry Christmas! 2.In a food processor with the metal blade: put in the sugar and add the butter in small pieces and process until smooth and creamy. Scrape down sides of bowl; add rosemary four and process just until mixture turns to crumbly bits. 3.Scrape out of food processor bowl onto a lightly floured surface. Mash together into a ball. Knead until mixture holds together. 4.Divide dough into two equal parts. Pat each piece of dough into a flat disk; wrap it in plastic wrap tightly and chill for 1 to 2 hours. 5.Roll out the dough on a lightly floured surface to ¼ inch thickness. Cut out the cookies using plain round or fluted 2” cookie cutter and place on cookie sheets. Sprinkle tops of the cookies with granulated sugar. 6.Bake for 20-25 minutes or until cookies are pale gold in color. They should not burn –Remove from oven and transfer to wire racks to cool. Store completely cooled cookies in an airtight container. Christmas morning egg dishes are the recipes that I have been collecting for a few years. I love this one because you prep it the day before and then stick it in the oven while opening gifts! Prepare a large lasagna-style baking pan- say, 12 x 15 inches- by schmearing it with extra virgin olive oil. Tear the cooled waffles into two or three pieces and line the bottom and sides of the oiled pan to make a crust. Dump the thawed spinach into a hot skillet, add the garlic, season with sea salt and pepper. Stir and cook it down over medium to low heat until all the liquid is reduced, about ten minutes. Press with paper towels, if needed, to remove all the moisture. Remove from heat and set aside. In a large mixing bowl, beat the heck out of the dozen eggs and add the milk. Add a dash of nutmeg or Old Bay Seasoning, to taste. 1. Scatter the smoked salmon all over the waffles. 2. Cut and layer the goat cheese evenly over the salmon. 3. Spread the garlicky spinach evenly over the goat cheese. 4. Press the spinach with a flat spatula [if there is any remaining liquid, blot it up with a clean paper towel]. 5. Add a layer of red and yellow pepper strips. Pat gently with the spatula to flatten. 6. Slowly pour the egg custard all over the layers, and allow the mixture to seep in and around all the nooks and crannies, without disturbing the layers. You want the egg custard to reach the bottom crust and soak in. 7. Sprinkle some shredded Parmesan all over the top- but not too much- let the beautiful red and green colors of the spinach and peppers show through. 8. Cover the strata with plastic wrap and chill overnight (or at least eight hours). Remove the strata from the fridge thirty minutes before baking. Pre-heat the oven to 350 degrees F. Take off the plastic wrap and bake the strata in the center of the oven till set and slightly golden. For me, that was about 45 to 50 minutes. Just keep an eye on it. Test the center with a wooden pick to make sure it is cooked all the way through. Set the strata on a wire rack for ten minutes before slicing and serving. Serves 6 hearty appetites or 8 as a light meal or side dish. My favorite holiday recipe is for sugar cookies with frosting. I remember getting sugar cookies from a Sunday School teacher when I was really little and I asked her for the recipe and have used that one ever since. I think her name was Sis. Harris. 🙂 I wish I could tell her that I really did love the cookies that much! Merry Christmas!! I received this link to a website for a recipe I would like to make and thought you might like to try it too: http://www.macheesmo.com/2009/06/brickle/ Looks yummy and easy and would make a great gift. Thanks for the giveaway chance! Here is my family’s favorite holiday recipe. Cover apricots with warm water and let set 30 minutes. Don’t skip this step or the bread will be really dry. Grease and flour pans. Pour into pans. Let stand 20 minutes. Bake 50-60 minutes at 350 degrees. This makes seven little loaf pans, or you can make larger loaves if you want. Start checking after about 40 minutes – the little pans cook faster. I use a toothpick test to check for doneness. They will crack across the top when done. These freeze well if you wrap them in foil. Enjoy! Melt butter and pb in microwave. Add sugar. Spread in lined 9×13 pan. Melt chocolate and spread on top. Refrigerate. Return to room temp to cut. Store covered. Sugar Cookies are a favorite of mine, but my family love my Fresh Coconut Cake and I can’t have Xmas without it. This year they are also asking for my Standing Rib Roast. Lisa I wish you and yours a wonderful Christmas. I love your blog and sure hope 2011 brings me to your shop. New sugar cookie recipe I just received just last night and they are easy and good. Took them to work at the Post Office and everyone enjoyed them. Sugar Cookies: 1 cup powdered sugar, 1 cup sugar, 1 cup butter, 1 cup oil, 2 eggs, 1 1/2 tsp. vanilla, 1 1/2 tsp. almond extract, 1 tsp. salt, 1 tsp. soda, 1 tsp. cream of tartar, 4 3/4 cups of flour. Cream together sugars, butter, oil and eggs. Mix together dry ingrediants and mix all together and then add flavorings. Roll into ball and flatten with a glass dipped in sugar. Bake at 375 for 9-10 min. It makes a big batch. 1 tsp. vanilla and 1 tsp. almond extract. My favorite Christmas cookie are gingerbread men. We have a tradition in our family that started in 1988 when my oldest son was 2 years old. We take an afternoon and make, decorate and bake them. In fact my two sons,daughter-in-law, and I did this yesterday afternoon! (Of course you can imagine during the teenage years we had some kind of “obscene” decorating going on!) Anyway, love your website and thanks for all your inspiration. Wish I didn’t live so far! Merry Christmas. I thought I did this once, but here goes again. My day starts by looking at your blog. I so enjoy the pictures and projects. Thanks for the chance to win a prize, and for keeping me inspired. -mix sugar and corn syrup in large microwaveable bown until moistened. microwave for 5min…..(owl will be hot…use pot holders). -stir in butter and peanuts, microwave 4min until golden brown. -add bakind soda and vanilla ( mix may foam) stir up and immediatly spread mix as thin as possible onto the baking sheet….pop in freezer to cool….break into pieces!!!!!!!!!!! My family’s favorite cookie is a carmel ice box cookie that was a recipe from my Grandmother. It is a crisp cookie that has pecans. I would love to be able to visit your shop. Cream brown sugar and shortening well, add eggs one at a time. Sift flour, cream of tarter, salt and soda together and add to the shortening mixture. Add nuts, water and vanilla, mix. Make into 3 rolls, wrap in wax paper and place in refrigerator until chilled, several hours or overnight. Slice and bake at 375 for 10 to 12 minutes or until slightly browned. What a generous “Elf”. Merry Christmas. This should be fun. The treasures look wonderful. My husband does not like bread stuffing so I make a wild rice dressing that can be put in the turkey or in a casserole dish. Can be served with other dishes than turkey also. Prepare rice according to package directions – adding 2 bouillon cubes to the cooking water. Meanwhile,saute celery and onion in butter and then add mushrooms. Add to cooked rice mixture. If cooking in casserole, place in preheated oven of 350 degrees for approximately 45 minutes. Good warmed up or put in turkey soup. My favorite Christmas recipes are for cookies. I cannot live without my Christmas cookies. I like Russian Tea cakes, sour cream sugar cookies with frosting, spritz, peanut blossoms, fudge, caramel corn. Some of those were not cookies were they! What beautiful presents you are giving away. I hope you have a wonderful Christmas. I try to make all of my kids favorite recipes. It is so much fun. One dessert that we love is called Moon Cake so I’ll give you that one. I hope your family enjoys it. Add 1 cup flour, then boil rapdily until mixture forms a ball (stirring constantly). Remove from heat and cool awhile. Beat in 4 eggs, 1 at a time; beating well. Spread on ungreated cookie sheet, 11×15. Bake at 400 degrees for 30 minutes. It will rise and look like moon surface. Let cool. Mix 2 small boxes of vanilla instant pudding according to directions, beat in 8 oz cream cheese and then spread on crust. Refrigerate for 20 minutes or longer. Top with cool whip and drizzle with chocolate sauce and chopped nuts. Here’s my all time favorite sugar cookie recipe..
Works great with cookie cutters – will hold it’s shape and very little spread. (I wish I could say that about me!) It also freezes well! degrees for 8 to 10 minutes or until just beginning to turn brown around the edges. This recipe can make up to 5-dozen 3” cookies. Great site and online store! I am looking forward to details of the Sweet sixteen BOM coming later in December. A gift would be great too! 2 c. choc chips, 2 c. butterscotch chips. Melt together and add 2 c. peanuts, 2 cups chow mein noodles. Mix until peanuts and noodles are coated. Drop onto wax paper (using 2 forks work well). Chill until firm. Enjoy …. if you are like me, they are hard to resist!!! What a fun giveaway. My favorite Christmas dish is a cranberry/apple salad. What a wonderful and Jolly idea. I LOVE a good recipe. Here is the one my son and I made today. Only 4 ingredients. EVERYONE loves them and it is so easy and no oven is necessary! Mix the oil, Hidden Valley Ranch dressing & garlic powder together in a large bowl. Pour in all pretzels. Stir every 15 minutes until the oil is absorbed. About 1 hour. Spread on a paper towel for about 30 mins. Store in an air tight container. Pretzels will NOT get soggy – promise! No cooking necessary. Make 2-3 days before you want to serve them as they taste better. ENJOY…Merry Christmas and Happy Holidays! I met you at Houston Quilt Festival. What a crowd your booth had! I am now hooked on Mini’s and loving it. After losing quite a bit of weight I really do not make a lot of recipes, but one of my favorites around the holidays is smoked turkey with mustard sauce!! What a gorgeous array of gifts! That little doll is so adorable!! I visit your blog and website daily. It’s Christmas all year! I truly love the baby doll in the photo – she will steal your heart. I don’t really cook anything special, but I sure do love to eat. Thank you for being so kind and generous all year. I visited your shop & warehouse sale last summer–90 degrees & humid; I had a GREAT time and went home with lots of goodies. You will love these bars; they are nice on a Christmas cookie tray, or could be used for Valentine’s day; Geo. Washington’s B’day, and/or tasty dessert at the Gathering. Mix together and spread in an ungreased 9 x 13 pan. Bake at 350 degrees until just faintly brown. 1 c. quartered marchino cherries, well drained. Stir the rest of the ingredients into the eggs. Spread filling on baked pastry. No need to cool pastry first. Bake about 25 minutes at 350 degrees. Cool, cut into bars and enjoy! Here are a few recipes you might enjoy! Beat egg whites until foamy with cream of tartar. Gradually add sugar. Beat until stiff. Add chips and vanilla and drop by teaspoons on foil. Place cookies in 350 degree oven and turn oven off heat. Leave in overnight. Drain chestnuts and toss with brown sugar and soy sauce. Marinate 1-2 hours to overnight. Wrap each chestnut with a piece of bacon, secure with a toothpick. Bake 15 minutes at 425 degrees, or until bacon is crisp. Serve hot. Good with sour cream and horseradish dip. Thank you for a wonderful year of beautiful projects. I love your shop & website, I don’t live close (Chippewa Falls) but have been to the shop a couple of times and I always tell my friends and family about it. I’m very happy that I can order on-line and look forward to using the coupon book on-line for 2011. Currently working on the wool purse from a kit I ordered from you. Keep up the awesome work, looking forward to reading the newsletters. I don’t bake a whole lot for the holidays but I do enjoy making Cut out Sugar Cookies. I wish you,your staff, and your family a Merry Christmas and a Wonderful 2011. Preheat oven to 375. Line a cookie sheet with foil (a bit extra foil so you can use it to lift from the pan.) Butter or spray the foil with Pam. Fill the cookie sheet with saltine crackers in single layer. In saucepan, combine 1 cup butter and 1 cup dk brown sugar (or light brown as you wish). Bring to a boil and boil for a full three minutes. You can stir in a teaspoon of vanilla at this point. Immediately pour over the crackers and spread to cover crackers completely. Bake for about 5 minutes. Remove from the oven and immediately sprinkle either 2 cups of semisweet choc chips or a large Hershey’s Symphony Bar that has been chopped into small chip sized pieces. Add chopped almonds or pecans if desired. You can also use graham crackers on the bottom but I like saltines better. When it has completely cooled, peel the candy off the foil and break into pieces. Hey Lisa, Happy Holidays to you and your family!! !We have Christmas Eve at our house every year and this is a must. I actually wasn’t going to make them this year, but one of the boys asked if I was making them, so you know how that goes. Anything to please the boys. Wash mushrooms and place on 2 cookie sheets. Place the rest of the ingredients in a saucepan and bring to a boil. Pour evenly over the mushrooms and place in oven at 300 degrees for 1 hour. I then put them in a slow cooker to keep warm. I usually serve with our main meal. Enjoy!!! Please enter my name in the drawings for the gifts! Thank you. What generous gifts you are giving away. My favorite christmas cookies are sugar cookies and peanut butter blossoms (the ones with the hershey kisses in the middle). I think it’s because I only make these two cookies at this time of year that they just scream Christmas to me. Another favorite is caramel corn. Instead of using real popcorn, buy the Old Dutch Puffcorn. On the back is the recipe for caramel corn using the Puffcorn. I don’t have a bag right now or I would copy the recipe here, but it’s always on the back of the bag. It’s super rich and buttery and you don’t get any hulls or old maids. Yummy! Peel and boil the potatoes. In a seperate pot cook the onions and mushrooms in the butter and garlic (we use a heaping tablespoon – we like garlic!) and salt and pepper. Mash the potatoes with sour cream and a little milk – you want the potatoes to be stiff. Fold in the butter/onion/mushroom mix. Add a little milk if needed for consistency along with extra salt and pepper if needed. Place in a LARGE casserole dish, sprinkle with paprika and bake covered for an hour at 350 degrees. Makes you wanna slap ya mama, sha! Lisa Merry Christmas to you and your family. I have enjoyed your website and all that you do. I just found a coarse breadcrumb mix by Progresso. Panko comes in lemon pepper, plain and italian style. I dipped boneless chicken breasts in egg/ milk and then dredged thru panko. I baked in the oven for an hr or a bit more along with sweet potatoes. so easy and delicious. Thanks for the chance at a wonderful giveaway! During the holidays, I always make special cookie recipes that I don’t make the rest of the year. These cookies are usually richer or more time consuming to make or just have that “tastes better at Christmastime” quality. Two of my favorites are Russian Tea Cakes (also called Mexican Wedding Cookies) and Buckeyes. Merry Christmas to your and your family. Since we moved to the NW from Florida and family doesn’t get to visit often we keep things simple. Dinner is prime rib with mashed potatoes and southern green beans with Black Bottom Pie for desert. If I make a snack it’s usually spinach, feta cheese stuffed mushrooms, a Paula Deen recipe. The gifts you are giving our wonderful and would be happy to win any one of them. I love your blog and website and hoping one day I’ll get to visit your shop—-sure you don’t want to open an annex in Oregon. Hello Lisa! I read your blog all the time and just wanted to let you know I’m working on a Christmas project for me now! I’m almost done with the six wool mitten ornies; too cute! Lisa, I only wish I could actually visit you- I follow you on line and read your blog faithfully. Please consider coming to The Mid Atlantic Quilt Festival in Feb- you are so creative and you inspire me to finish my UFO’s to start even more. Thanks, Lisa… I know it takes a lot of work and sacrifice on your part, not to mention the time it takes away from Nick and the boys- thanks for all you do to inspire us. You are a blessing. I’ll send a recipe soon- just wanted to drop you a line. Merry Christmas and all of the very best for 2011!!! Blessings always! First of all let me tell you thank you for sharing and showing on your web site and your blog. I look forward to receiving your updates every time they come to my email. Here’s a quick recipe that I used for several holiday parties and it even looks like the holidays. Add green bean and mushroom mixture. Stir fry and cook until beans are tender. Add cherry tomatoes at last minute. Serve on flat platter so the guests can see the combination of colors and textures. You shared a great green bean recipe awhile back – here’s mine for Sesame Green Beans. They are great hot or cold! 1 lb Fresh Green beans when in season or a bag of Frozen, cooked. I like to steam. Combine 1 Tbsp Sesame Oil, 1 Tbsp Soy Sauce,1 Tbsp Brown Sugar, 1 tsp white wine vinegar, 1 tsp ginger powder 2 Tablespoons toasted Sesame Seeds in a bowl. Pour over beans and stir well. 16 oz of whipped topping. 1 pkg. fudge stripe cookies – save 4 or 5 for the top and crush the rest. Just before serving stir in the crushed cookies and put the whole ones on top. Thanks for all your ideas!!! Merry Christmas to you & yours! I can hardly believe Christmas is less than a couple days, but in all honesty, I cannot wait for the holidays to be behind me, to pack it all away & lock myself into my sewing room for the winter months sewing!! 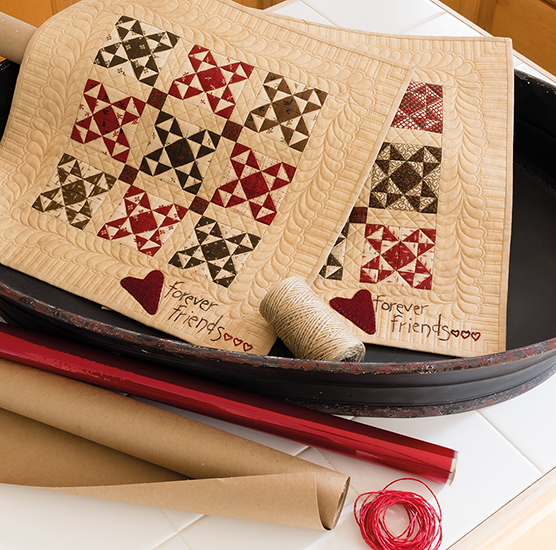 Can’t wait to get out to your shop in search of that perfect quilt pattern & fabric!! 1/2 c catsup, 1/2 c packed brown sugar, 1/4 tsp worcestershire sauce, 1/2 c barbeque sauce, 1 1b cocktail weiners or little smokies. Mix together catsup, brown sugar, worcestershire sauce & barbeque sauce together in slow cooker. Add smokies. Hi Lisa! I always enjoy reading your blog and seeing what you are up to. You are an inspiration! I especially enjoy your pictures. Slow boil sweetened condensed milk in the can for 2 hours the night before you make the carmels. The next day combine all ingredients, bring to a boil, stirring constantly. This mixture should be cooked until it reaches 240 degrees with a candy thermometer (or soft ball stage). Pour into buttered cookie sheet. Let cool, cut into squares and wrap in waxed paper. If this is cooked too long, you will have slo poke carmels. It is always a challenge every year to see if we can get “the perfect carmel.” We sometimes put walnuts, peacans or almonds on the cookie sheet before pouring the hot carmel mixture out of the pan. I hope you have a great holiday season and hope your try our recipe. Mine is Turkey with my dressing made with raisins and white wine. We met you at the Iowa Show last year. I can’t wait to shop again. Hope to see you soon. I did wool crazy thru the shop. Merry Christmas! Yum, you’ve been left some interesting recipes already – going to copy some of these down. Here’s one for an extremely easy to make melt in your mouth shortbread. Thank you, Lisa and a Blessed Holiday to you and yours. teaspoonfuls onto baking sheet. Bake until edges and bottoms are a light golden brown. 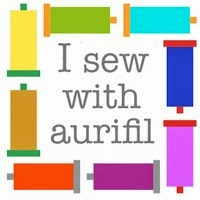 I enjoy your blog and have ordered numerous times from your website, hope to get alot of sewing done after the holidays. To visit your shop is on the to do list for this coming year! Thankyou for the generous give aways with an order on the day after Thanksgiving! Our family always has to have cheese ball for Christmas. 1 8 oz. cream cheese, 1 c. mild shredded cheddar cheese, one small onion, cut up, 1 tbsp. worchestershire sauce and 1/2 c. sliced stuffed olives. Mix all together. Shape into a ball and roll in 1 c. chopped nuts—we skip rolling it in the nuts. Refrigerate or freeze. I like the snowflakes falling on this page! Merry Christmas! Looking forward to shopping after Christmas. Hope to see you there! I am on month three of your Lisa’s Flower Garden BOM and am just loving it. We always have pancakes and hot sausage for Christmas eve meal after church. Started with my parents many years ago and it’s nice to keep traditions going. Merry Christmas from New York. Love, love, love your website and your blog. New favorite cookies are Truffles made with oreos. 1 pkg chocolate oreo cookies, 1 -8 oz package cream cheese softened, semi sweet baking chocolate melted. Crush cookies in food processor add cream cheese, mix until well blended. Roll cookie mixture in to about 40 balls. Dip balls in melted chocolate and place on wax paper. refrigerate until firm about 1 hour. I can tell you there will never be any leftovers, these cookies are just that good. I always bring a cheese ball to holiday gatherings. Super easy…just mix up a packet of Ranch dip mix with a package of Philly cream cheese, add some chopped green onions, fresh bacon bits, and shredded cheddar. Roll into a ball and roll in more shredded cheddar. Place on a festive Christmas plate with crackers and a Christmas cheese knife and you are good to go! Merry Christmas and I hope you and your family have a great coming year. I love this recipe and use it all year with many different meats, poultry and fish. Add enough water to the pineapple juice to equal 2 cups of liquid. Grind cranberries while still frozen or process a few seconds in a large processor. Add the sugar. Heat the liquid mixture until near boiling. Add gelatine stirring to disolve. Add pineapple and gelatine to the cranberry mixture. Stir well and put into abowl or mold. Chill until set. This can be made with sugar free or reduced products. Can be made several days ahead or the meal. I made over 20 different kinds of candy and cookies this year. I get lots of comments on my Snicker candy. In a large bowl mix br. sugar, marg, and corn syrup. Put in microwave on high till it comes to a boil. boil for 2 min. add soda and stir till it foams up. Microwave on high 1 1/2 min. Microwave on high 1 min. Microwave on high 1/2 min. Pour onto a cookie sheet to cool Enjoy! Happy Holidays, Lisa! What a generous giveaway! Preheat oven to 350°. Mix sugar, butter, and egg yolk. Stir in flour, cinnamon, and vanilla. Press out on 1½” jelly roll pan that has been lightly greased. Spread out as thin as possible. (Use flour on hands if needed). Beat egg white and water until foamy. Brush over dough. Sprinkle with walnuts. Bake until very light brown (approximately 20-25 minutes). Immediately cut into 3″ x 1″ bars or 2″ x 2″ squares. Cool. Store in an air tight container. Hi Lisa. We just made our 3rd batch of these, so this year these are our fave. Almond Bark Candies – 1 1/2 pounds almond bark, 2 c. mini marshmallows, 1 c. peanut butter, 2 c. rice krispies, 2 c. salted peanuts. Melt almond bark, stir in peanut butter, rice krispies and peanuts. Fold in marshmallows. Easy and yummy. I love your blog and I especially love working with wool. The thing I make the most is biscuits. I know biscuit. However: 2cups flour(sifted)…4tsps. Baking powder… 1/2 tsp. salt. Combine. Then add 1/3 cup of veggie oil & milk to make 1 full cup.Mix together & roll out to about i/2 inch thickCut out with your cutter&. Place on your baking sheet & let them rest for about 4mins. Bake 425 oven for 12 to 13 mins. I started using the oil when I went to a HEART smart classes to bake healthier I do hopr you like them. Dianne. I could really use those precuts….I have been in physical therapy for months as a result of a mishap by my doctor. Anyway my therapy allows me to sew but only do minimal cutting, so I have found precuts are in my future for a while. Your fabric giveaways are luscious. Beat the egg white and water until foamy not stiff. Pour nuts in this mix until they are all wet. May be frozen, but who are we kidding they are usually eaten before you get the chance. What a great giveaway! One of my favorite Christmas recipes is for Apricot Bars. These are DELICIOUS!! Cream butter, margarine, and sugar well. Add egg yolks, flour, and vanilla. Mix thoroughly. Spread dough in 9×13 greased baking dish, but save enough to put over the preserves (about the size of an orange). Spread preserves over dough; then dot with remaining dough. Bake at 350 degrees for 30 minutes. Cut in squares when cool. This summer I made your ‘Forest Floor’ pattern and loved it so much I made another and donated it for a charity auction to benefit a heart transplant recipient from our community. Even better yet, a quilter friend purchased the quilt so it is being loved & appreciated! My sister and I are passionate about your designs & seeing your booth @ the Madison show. One of these days, we’ll make it to Menasha. Two friends here in Iowa have already beat us to it after hearing us talk about your wool patterns. Recipes … being of Norwegian and German descent, lefse and the honey cookie recipe passed down from my Great Aunt, are “must dos.” I also love to make Christmas Tree Bread. You roll the dough into a rope and starting at the top, weave it back & forth in the shape of a Christmas tree. Add the trunk at the bottom and after its baked, frost and add red & green maraschino cherries and even sprinkle with colored sugar if desired. It’s gorgeous & everyone loves it! How fun! What an amazing and generous giveaway!! One of my favorite and easy recipes is stuffed mushrooms. 1 package cream cheese softened. Preheat oven to 350. Fry sausage in pan. Drain grease. Mix in cream cheese. Stuff mushroom tops and place on a cookie sheet. Make sure to spray cookie sheet with Pam. Bake in oven for 25-30 minutes. Serve warm out of oven. It’s a real crowd pleaser! The guys love them! Love your shop! It’s a must visit every time we are in the area and at any quilt show you are at! Simple candy for you….mini pretzels, Rolo candy and pecans. Place pretzels on a foil lined cookie sheet. Place an unwrapped Rolo candy on it. Put in 250 degree oven for about 4 minutes. Press a pecan on the top of the candy…it will smoosh down. Let cool. Quick and easy and yummy! Hi Lisa: Wishing you and your family a Merry Christmas and blessings for the New Year. Here is my favorite Christmas recipe. My family & Blockhead friends love it! Place roast in shallow roasting pan lined with foil. Press seasoning evenly onto all surfaces of whole tenderloin. Do not add water or cover. Roast 50-60 min. for medium rare, 60-70 min. for medium doneness – but depends on how thick/fat your tenderloin is. When cooked to your likeness, let stand 15-20 minutes. Cut tenderloin into very thin slices and serve with small dinner rolls. What a nice idea, thank you for giving so much to your customers. I live in California, so I’m really too far away to ever get to your shop, but I always look forward to seeing you at Road to California and the Long Beach show in July. I wanted to tell you that my friendship circle decided this year to draw names and make wool projects. We all bought kits online from your website (some of us had kits we purchased from you at shows) and exchanged them on Saturday 12/18 at our holiday brunch. It was so much fun we decided to do it again in 2011. The pictures of The Gathering are great…maybe someday! Love all your goodies and surprises!! Peel and discard outer layer of parsnips as they have a waxy coating. Peel the rest in long strips down to the core. Deep fry at 350 degrees a minute or two , until light brown. Drain on paper towel and salt. Can do it in a deep pan on the stove and check temp with a candy thermometer. Do these in small batches so the temp doesn’t drop too much. You can do these a head of time. My family loves when I serve appetizers on Christmas Eve. Nothing fancy at all…just simple things like bacon wrapped water chestnuts in BBQ sauce, cocktail weiners in BBQ sauce and pickles slathered in cream cheese, wrapped in Buddig Beef and sliced! Awesome! Aren’t the holidays all about the love of family AND food? How fun Lisa! Thank you for your generosity! My favorite Christmas salad is the traditional Seven Layer Salad. Start out with a casserole type dish. The seven layers consist of lettuce, frozen peas that are thawed and drained, green peppers, onion. Take a cup of mayonaise, thin it with an equal amount of sugar and vinegar (1/8 cup each),and add black pepper: spread over the top of the salad, add a layer of shreaded mild cheddar cheese and bacon that has been cooked and crumbled. Refrigerate several hours before eating. Enjoy! 12 oz chocolate chips….or a handful more if you love chocolate! Line a 9×5 loaf pan with wax paper. Melt chocolate slowly in a saucepan; remove from heat add condensed milk, vanilla and walnuts. Stir well. Pour into wax paper lined pan. Refrigerate several hours until firm. Turn out of pan and cut. Place 1 Rolo candy on a pretzel on wax paper. Place in a warm oven 175′-200′ until soft. 5 minutes or so. flattening the Rolo. Let cool. Enjoy!!! Merry Christmas to you and all the girls working in the shop. I’ll share this wonderful dip recipe. Serve with pretzel’s or crackers, tastes great on a ham sandwich too. Hi Lisa, Happy Holidays to you and your family. Line 8″ pan with foil, extending foil over edges, lightly butter foil. Melt chips in large saucepan over low heat, stirring till smooth. remove from heat, stir in frosting & peppermint extract. Spread in buttered lined pan. Drop food color over fudge and pull knife through mixture to marble. Sprinkle with crushed candy. Press lightly. Refrigerate until firm about 1 hour. Remove fudge from pan by lifting foil. Remove foil from fudge and cut into squares. Enjoy! Lisa, you’re always so good to us. At Christmas I love cooking (and eating) almost as much as opening presents. One of my favorite recipes is a chili dip. I use my small crock pot to heat it and keep it hot. Combine all ingredients and heat in small crock pot. Combine all ingredients in a medium serving bowl. It’s so pretty and even little ones will eat the cottage cheese when served this way. I love your shop and wish I could visit in person, Lisa. I live in Stuttgart, Germany, and I have been a faithful customer of your shop since I have lived overseas. We were in Seoul, Korea before this. My husband is an Army officer, and we have been stationed now overseas for almost SIX years! 🙂 Your shop has been so great to send me things I needed…lots of BOMs, fabric, etc! I am doing the A Christmas quilt and finishing up the Pocket of Posies quilt (finally). I can’t wait to one day meet you, and thank you personally for helping a military wife enjoy her quilting while overseas. We will be returning to the US this May. I do a fair amount of entertaining, and one of the favorite appetizers I serve around Christmas time is a favorite with the men. Very simple: bacon, parmesan cheese and club crackers. Preheat oven to 200 degrees. Take a club cracker, put a teaspoon of parmesan cheese on it, and wrap with a half slice of bacon. Place on a broiler pan. Do this for as many appetizers as you like. Bake for 2 hours. Let sit for an hour. In my German oven, this sometimes takes a little longer I found out. I had to up the degrees some! You can bake these ahead and freeze. Reheat until warm. Easy and good! I hope you have a wonderful, merry Christmas! Love your site. Have ordered many kits from your site. Love it when you are at qult shows I attend. You really need to make a trip to Minneapolis to see your good buddy Stacy. Teach a class. I could fill it with just my friends. Here is a favorite simple recipe. Mix all above ingredents with the cold rice to the desired wettness you like. Every time I make this it goes like wildfire and I always double this recipe, the cranberries and the broccoli make it look Christmasy. Wow what a generous gift you are giving. I would love to have all of that and head to my sewing room. I love to make carmel corn out of the Puff Corn and the recipe is on the bag. Also I sometimes like to melt White Almond bark and coat the puffs with that. Both are so good. Merry Christmas! Thank you for making the quilting world more exciting. I really like your designs and am so thankful for you bringing your patterns, kits, and talent to California. I am looking forward to seeing you at The Road To California. Snowball cookies are a tradition in our family. What a generous giveaway! One of my family favorite recipes is simply called that weird green jello salad. Make one large box of green jello. Let it set up until it is soft set, then add one can crushed pineapple, drained. About 2 cups of cottage cheese and one cup grated cheddar chess. Let set up completely. It looks awful but tastes heavenly. This is my favorite recipe for a Christmas treat. Mix cream cheese and butter. Cream well. Add flour mix. Form into ball. Chill overnight. Divide dough to make 24 balls. Put one in a mini muffin tin. Press with thumb to bring crust up to the top of tin and over a little bit. Slightly beat eggs, add other ingredients and mix well. Drop by spoon into crust. I doubled this recipe to make 48 tarts but needed to triple filling ingredients. Lisa…thank you for having such a wonderful web site…I look forward to each day to read your blog and all the new projects. Mix softened cream cheese and 1/2 c sugar. Stir in cool whip, add drained pineapple.Just before serving stir in the pretzel. Save some for the top. Enjoy. Thanks again, Lisa, merry merry to you and yours. Lisa, thanks again for yet another wonderful opportunity. Love reading your blog and shopping at your website! My favorite recipe for a holiday appetizer is stuffed mushroom caps, quite a different version from an earlier post by Linda, but equally yummy. I don’t have a “written” version, so here’s my best attempt at how I make them. Wash and cut stems from mushrooms to leave just the cap. Hollow out some of the cap to allow room for the “stuffing.” Save the stems to add to the onions and celery. I usually dry my own bread cubes from Italian bread, but you can use unseasoned dried bread cubes (much like croutons.) Sprinkle dried marjoram over bread cubes placed in a small bowl. Set aside. Bake in a 350 degree oven for 25-30 minutes or until mushrooms are tender. Merry Christmas and best of health in the New Year! Hi Lisa! Wishing you and yours a wonderful Christmas Day! We are just wrapping up an early celebration with all 3 kids plus our little grandson here! Too fun! Something we had on hand is Butter Toffee- so, so yummy! The recipe I used this year is a new one from Pioneer Woman- enjoy! Hope you’re feeling better. Here’s a favorite “make the night before” recipe for Christmas morning. We serve this at our quilting retreats here in So. CA. Hope I can be a retreat guest at “The Gathering” one day. Merry Christmas! dissolved. Pour into a 9×13 inch baking dish. Sprinkle pecans in dish. the dish from the refrigerator, and bring to room temperature. until puffed and lightly browned. Loosen the edges with a knife, place serving platter on top of dish and flip onto serving platter. Would love to visit your store, but can dream!!! Heres our family favourite recipe. Bear with me for English translations….you will get the drift! Sweat down the onions, in seperate pan cook the cranberries in the cider, until soft and mushy, mix with onions, mushrooms and sausagemeat….yes girls, with your fingers…season with salt and pepper. pack into a nice oven-to-table dish and cook in the oven with your turkey for an hour or so. yummy. Ik like everything with choclate!! I am not a good cook but a simple chocolat cookie wil do. Please come East for a class, show, etc! My favorite holiday cookie so far this holiday season has been the Fudgy Brownie Cookie recipe from lifesambrosia.com. To make it a little more festive for the holidays, you can add crushed candy canes. I brought these to our guild party and everyone thought they were awesome. Here is wishing you a happy holiday and a great New Year. I can’t wait to see what you “cook up” for us next year! I LOVE your blog and website. You are an inspiration. What a gorgeous looking bundle! My favourite Christmas recipe is one my family call ‘alternatives’ as they were made as an alternative for those who don’t like mince pies. It’s basically a batter with a little sugar added, throw in any dried fruit and nuts you like, put them into individual muffin or fairy cake trays and bake in a medium oven for about 15-20 minutes depending on you oven until they turn light brown. We don’t make this often anymore because it’s too tempting…this is a recipe my Mom (87) learned from her Mom…worth the effort! My sister, Debbie, and I are from Ontario, Canada, and have been very fortunate, and quite a bit poorer, after visiting your booths in Nashville, Houston and Chicago. You seem to always remember us, not too hard I guess, because we visit your booth several times each show. It’s always our favorite – hands down. I am currently involved in your Aunt Maggie’s BOM and am loving it – it’s brought me out of my comfort zone. I love the idea of coming for a retreat, and am going to try to convince my sister and the quilt group I started this fall in our small town (so far we’re 15 strong and having a great time) to consider it. My wish for you and yours is a peaceful, joyous Christmas and a New Year filled with health and happiness! Here’s my recipe for my favorite Christmas cookies – I’ve got somewhat of a reputation for my baking, and these always get raves! 1. Preheat oven to 350 F. Line cookie sheet with parchment paper, set aside Chop 4 oz of the white chocolate and set aside. Melt the remaining 4 oz. white chocolate (I use the microwave, on half power, for short periods of time). 2. In a large mixing bowl, beat butter with an electric mixer on medium high speed for 30 seconds. Add sugar, baking powder and salt. Beat until combined, scraping bowl occasionally. Beat in eggs and vanilla. Beat in melted white chocolate. Beat in as much of the flour as you can with the mixer. Stir in any remaining flour. Stir in the chopped white chocolate, crushed candy canes and mini chocolate chips. 3. Drop dough by rounded teaspoons 2 inches apart onto prepared oookie sheet. Bake in preheated oven for 8 – 10 minutes (9 minutes in my oven) until cookies are lightly browned around edges. My favorite dessert is The Ultimate Strawberry Shortcake. It is to die for. 20 minutes to prep. serves 12. 1 quart of strawberries. 1/2 cup sugar, 8 ounces cream cheese, softened, 1 cup powdered sugar, 1 (8 0unce) container frozen whipped topping, 1 (14 ounce) angel food cake cubes. I buy the cake already made. Wash berries, cut in half, add sugar: toss to mix well. Chill, beat cream cheese and powdered sugar well. Fold in whipped topping and cake cubes. Spread cake into an ungreased 13 x 9 dish. Cover chill for at least 2 hours. Cut cake into squares; top with strawberries. Lisa I make this all the time. Seems I never have any left. In the winter I have to use frozen berries but it is still so good. Try it I am sure you will love it and your family will thank you for it! Happy Holidays to you and your family. Hi Lisa, It was so nice to meet you this summer in Dulth, Ga. I have ordered from you for several years and felt like I knew you. Thanks for all that you do for your customers. I love it. My receipe is for a Cheese Ball. You will need 2 8-ounce pkgs. of cream cheese, 1 stick of butter, softened, 1 cup sugar, 1 cup of craisins(dried cranberries). Mix all in mixer and shape into a ball and roll in chopped pecans. Let set in refrigerater overnight. Delicious!!! I use wheat thin and club crackers with the cheese ball. Enjoy. Betty Forester Trenton, Ga. Thank you for your generosity now at Christmas time. My favorite recipe is Dreamscycle Fudge by Bonnie Hunter over at Quiltville.com. I have been busy cutting out all the flowers and leaves for the Lisa’s Flower Garden block of the week. It is my wintertime lapwork project for the cold days coming in January. Thank you for being an inspiration to so many of us. 1 lb. gumdrops – Defrost in microwave for 2 minutes and cut into small pieces with scissors. These are the big gumdrops, coated with sugar, not the tiny baking ones. Place in a bowl and stir together with 1 cup flour. Set aside. Add in 2 cups applesauce and stir. Now add your gumdrop and raisin mixture. I have a set of 3 square pans, in graduated sizes, with removable bottoms. Choose either the large one, or the small and medium one. Line with a double layer of parchment paper. Spray the top layer with cooking spray. Add batter. Bake at 275F for 1 1/2 hours, until done. Allow 3 hours for baking as it is slow! Lisa; Your chewy gingerbread cookies have become one of our favorites. I can’t keep them in the house…as soon as I make a batch my husband starts munching on them daily until they are all gone! I love your blog as it inspires me daily as does your online shop. I wish I had a recipe to share but I am not a baker, DH is diabetic. But I can dream as I read all the recipes left. HI Lisa…Hope your Christmas is Joyful! At least once during the season I have to make ‘Orange Date Bars’ This was a bar my mother-in-law made 40+ years ago and would have on her dessert bar for the holidays. Wouldn’t be Christmas without it! Combine ingredients in usual manner and spread 1/2 on the bottom of a 9 x 13 greased cake pan. Spread filling over and top with the remaining 1/2 of the cake batter. Bake 30 to 35 min. in a 350 oven. Cool before slicing. After cutting the bars I dust them with powdered sugar on the serving tray. Thanks for a wonderful shop and the great girls you have working in it! They make shopping there a joy! I wixh you and your family a Merry Christmas. My favorite Christmas recipe is Saltine Toffee. It’s the first cookie my son and I make every year. We always end up making another batch since it never makes it to Christmas. I was introduced to quilting and your shop about a year ago by my friend Katie. I am really enjoying my new hobby. I hope you and your family and staff have a wonderful holiday season. A favorite holiday appetizer —- a loaf of Pepperidge Farm thin skiced bread. Romove crusts and roll each slice thin with rolling pin. The original recipe calls for a can of asparagus drained well but we love roasted asparagus so I do that and use it instead. Mix 8 oz. Cream cheese, 3 oz. Crumbled blue cheese, 1/2 tsp. Horseradish and 1 egg. Spread mix on bread slices, add a stalk of asparagus and roll up tightly. Refrigerate. Melt 1/4 lb butter. Dip each roll in butter, place in freezer bag or container and freeze. When ready to serve, slice each roll into pieces, place frozen on cookie tin and bake at400 for 15 min. These are great to have on hand in the freezer. Thanks again for all you do and wishing you and all your family a very Merry Christmas and Happy New Year. What a fabulous and festive idea! I have been enjoying your blog for quite awhile now. There is always something inspiring to look at. 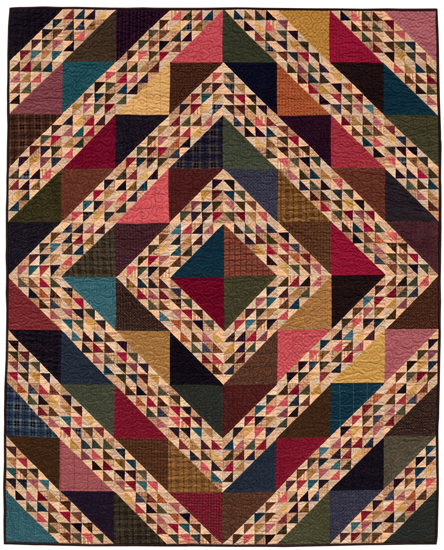 I especially loved all the quilts in ’25 years of quilting’ show. Love your shop and your books! They are the only books I have where I want to and have made many more than just one thing. I’m current;y working on the strawberry candle mat and the jar of daisies wool appliques! My recipe was originally an honorable mention in the Chicago Tribune cookie contest in 2001. I have been baking it every year ever since. I also found it in my mother’s recipe collection. Beat butter and granulated sugar in bowl until light, about 3 minutes. Beat in brown sugar, egg, orange juice, and zest on medium speed. Stir in flour and baking soda. Stir in nuts. Shape into two 9 X 2 1/2 inch bars and wrap in plastic wrap. Chill 8 hours. Heat oven to 350 degrees. Cut bars into thin slices and place on lightly greased cookie sheets and bake until edges begin to brown, about 10 minutes. Cool on wire racks. Hi Lisa, I visit your website and blog daily. It is such inspiration. Thank you for making the internet customers feel part of everything you do. Hope to get to your shop and The Gathering one day. Wishing you and your family a very Merry Christmas and a Happy New Year. My favorite recipe is this Peanut Butter Mint cookie. I bake about four batches of these every Christmas because they are everyone else’s favorites too. They also look very impressive. Preheat the oven to 375 degrees. Stir together flour, baking soda and salt; set aside. Cream together butter, peanut butter and the sugars. Beat in the egg and vanilla. Gradually beat in flour mixture. Using generous half-tablespoons* of dough, shape into logs about 2 inches long, roll in granulated sugar and place on greased baking sheets 2 inches apart. Bake for 6-8 minutes or until crackled and lightly brown. Cool five minutes, remove to cooling rack. Place Andes Crème de Menthe Wafers in small saucepan or top of double boiler, set over hot (not boiling) water, cover and allow to melt 10 minutes. Whisk until smooth. Dip one end of each cookie into melted Andes, tipping pan if necessary to cover about ½ of the cookie with the coating. Drain off excess and place in wax paper-lined baking sheets. Refrigerate 15 minutes or more. Remove to room temperature. Makes about 4 dozen cookies. Lisa, my family always asks for this cheese ball. We eat on it for weeks! Soften the cheese & margarine to room temperature. Blend together and then add the remaining ingredients. Form into a ball, wrap in plastic & chill. It wouldn’t be Christmas without pizzeles. My husbands Aunt got us hooked on them. She is gone now but I think of her when I make these I play with the recipe sometimes but this is the original. You can add vanilla or lemon extract in place of the anise. Just mix it all up and bake in a pizzele maker. Love you blog. I order from you, would love to visit your store some day. I live in PA.
Hi Lisa, Merry Christmas to you and your family. I have a favorite sugar cookie recipe from my neighbor. It’s called Special Sugar Cookies and it needs to refrigerate(I didn’t know that the first time I made them). 1 teas. baking soda; 1 teas. salt; 1 teas baking powder; 1 cup sugar; 3 cups flour; sift together. 1/2 cup butter; 1/2 cup crisco. Cut into dry ingredients, til looks like corn meal. Add 2 eggs, beaten; 4 TBL milk; 2 teas. vanilla. Refrigerate overnight or for a few hours. Roll out 1/4 inch think and bake at 400 on a greased cookie sheet 3 to 5 minutes. Butter Frosting: 1 stick butter softened; 1 lb powdered sugar; 1 1/2 teas vanilla; add a little bit of milk or evaporated milk. The frosting recipe makes ALOT. I cut it in half for the cookie recipe and had plenty. Want your house smelling yummy on Christmas morning! These are so easy and they taste so yummy!!! Spray 9 X 13 pan or jelly roll pan with PAM. Place frozen rolls in pan. Melt butter over low hear, add remaining ingredients and stir well. Pour over frozen rolls. Bake at 350 degrees for 30 minutes. Remove from oven and immediately flip rolls over onto large platter. From one LB to another–Merry Christmas! Actually, it’s like Christmas every time I visit your web site. It’s such a treat to see all the yummy things you offer. Hopefully I’ll get to your shop one day and see it all in person, and of course I wouldn’t mind at all if you drew my name and sent me one of quilter santa’s goodies. Here’s my favorite recipe for the holidays. It’s not particularly Christmasy but it always gets rave reviews and it feeds a lot of people, so it’s perfect for when the entire family is over or for the quilt guild Christmas party. Enjoy! Heat oven to 325 degrees. Generously grease and lightly flour 12-cup Bundt pan or 10-inch tube pan. In large bowl, combine cake ingredients; blend at low speed until moistened. Beat 3 minutes at medium speed. Pour batter into greased and floured pan. Bake for 55 to 70 minutes or until toothpick inserted in center comes out clean. In small saucepan, combine all sauce ingredients; cook over low heat, stirring occasionally, until butter melts. DO NOT BOIL. Using long-tined fork, pierce cake 10 to 12 times (I poke more holes to distribute the buttery goodness). Slowly pour hot sauce over warm cake. Let stand 5 to 10 minutes or until sauce is absorbed. Invert cake onto serving plate. Just before serving, sprinkle with powdered sugar. Serve with whipped cream, if desired. Merry Christmas Lisa. Wishing you good health. My recipe is a tradition. It’s hearty and full of flavor. Our family loves it. Transfer to a 5 qt. slow cooker. Stir in the remaining ingredients. Cover and cook on high for 3-4 hours or until heated through. I serve this when everyone brings fingerfoods. I sometimes add other canned beans for variety. Hi Lisa! Love, love, love your website, store and blog (and Nick is awesome of course)! For Christmas we actually make homemade caramels. It takes almost an hour of constant stirring but the end product is well worth the effort. Everyone looks forward to them at Christmas. I have also started making chocolates and truffles. I do love the seasoned pretzels that was posted earlier. Merry Christmas and we’ll see you the week after Christmas for your sale. Hi Lisa, I love all of your patterns, books, fabrics and wool. I would like to share a favorite Cranberry Salad recipe with you. The salad has the taste of “fresh fruit”. Prepare orange Jello with 1 cup boiling water. Cool. Add cranberry sauce and pineapple and stir (you may need to mash the “jel” with a fork). Add apples and stir, then add mandarin oranges and stir. Put into an 8 x 8 inch square dish or mold. I love your website and your blog, one of my goals in life is to visit your shop and maybe now with “the gathering” that will be possible. I make a praline chex mix every year and no one ever seems to get tired of it, it is always a hit. So here goes.. Preheat oven to 325, On a cookie sheet with a rim, place 6 cups of your favorite chex combination add 1 cup of peanuts, in a small pan put 3/4 c butter and 3/4 c brown sugar bring these to a boil, boil and stir for 2 min. Then pour over the chex mix, Bake in oven for 8 min, when time is up pour out onto a brown bag (I use Kraft paper on a roll) and let cool. After the mixture is cool pour into a lg bowl and add, christmas colored M&M’s, 1 cup or more of craisen’ and 2 cups vanilla covered pretzels. Muy delicioso……..Thanks for the great giveways, and Merry Christmas to you and your family. Wow…what very generous giveaways! My husband and I love soup in the winter, and our favorite is a chicken curry soup. Over the years I’ve made changes to the original recipe, and here is our favorite version. We like soup with lots of “stuff” in it! Saute onions, celery, carrot in the butter in a large soup pot until softened. Add flour and curry, and cook 3 more minutes stirring occassionally. Add chicken stock, mix well, and bring to a boil. Simmer about 15-20 minutes. Add apple, rice, corn, chicken, salt, pepper, and thyme. Simmer 15-20 minutes, or until rice is done. Just before serving, stir in the cream. Thank you for sharing your recipes and pics on your blog. I’m fixing your green bean recipe for Christmas dinner. I’m in the process of finding new favorite recipes that are gluten free. Put a mini pretzel on a baking sheet and top with a unwrapped Hershey Kiss – any flavor. Put in 350 degree oven for about two minutes – to soften the kiss. Remove from oven and immediately top with a M&M. Viola! You are finished. Peace and blessings to all for an amazing Christmas and 2011. Lisa your blog is wonderful. Anyone that does not know you personally certainly gets the feeling by reading your blog that you are a long time friend. My receipe for the holiday is pickled mushrooms for your favorite drinks. One of my favorite treats at Christmas time is coconut layer cake. My mom always made it every year. She used Cool Whip in the frosting and it was always fresh and moist. I enjoy your blog and love your shop. What I a great idea, I wish I would have thought of it. I love old movies – and when my adult kids are home around the holidays we love to make kettle corn and put in a circa 1930-40 remake on a DVD. Microwave popcorn does not work well, it works best to make popcorn the old fashioned way, with oil in a pan for best taste and adhering of the sugar and salt. Heat oil over medium heat in a large pot with a tightfitting lid. When it shimmers, add kernels, cover, and shake to evenly distribute. Once kernels start popping, gently shake the pot until the popping dies down, about 2 to 3 minutes. Remove from heat, immediately toss popcorn with sugar and salt, and serve. you are the best i love your blog & shop some day i will c it in real time hope u are ok after your cut job (sugery) it is no fun. One of the favorite cookies at our house are the ginger cookies, similar to the recipe you put on your blog, but a little crisp and not soft. I almost tried your recipe but was afraid my family would freak! I so enjoy working with your wonderful wools and your patterns. Thanks so much for contributing to my sanity! I have been a fan of yours for a very long time. I have purchased your books and love to work with wool now that I saw your tips and tricks lecture at Madison. Your inspiration, your boundless energy, and ideas are amazing. I love reading your blog to find out new things you are doing. I even made a wall hanging of the miniature blocks your posted last year (plus a few more). I wish you a Merry Christmas and to all or your coworkers as well. Peel and shred potatoes. Heat butter and soup; blend in sour cream, green onions and 1½ cups of cheese. Add potatoes and mix well. Bake in buttered 9 x 13 pan at 350 degrees for 45 minutes. Top with remaining cheese, and bake an additional 15 minutes. Happy Holidays to everyone at Primitive Gatherings! etc. We also look at the new stuff and compare what we each like! Hope you, your family and all your employees have a Very Merry Holiday season! Lisa, I follow your blog religiously but have never commented–I’ve ordered numerous times and visited your store twice while traveling however. Your drawing for gifts was incentive enough for me to comment! By the way, your merchandise offerings, blog, shop, and your shop staff are wonderful. 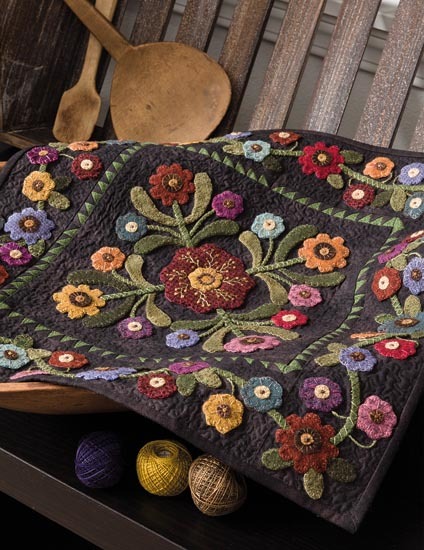 Wish I had an opportunity to take one of your wool applique classes. Line a 15 inch x 10 inch baking pan with parchment paper; grease the paper. Place egg whites in a small mixing bowl; let stand at room temperature for 30 minutes. In a large mixing bowl, beat egg yolks on high until light and fluffy. Gradually add 1/2 cup sugar, beating until thick and lemon-colored. Combine flour, cocoa and salt; gradually add to egg yolk mixture until blended. Beat egg whites on medium until foamy. Add cream of tartar; beat until soft peaks form. Gradually add remaining sugar, beating on high until stiff peaks form. Stir a fourth into chocolate mixture. Fold in remaining egg whites until no streaks remain. Spread batter evenly in prepared pan. Bake at 350 degrees for 12-15 minutes or until cake springs back (do not overbake). Cool for 5 minutes; invert onto a “linen” towel dusted with confectioners’ sugar. Peel off parchment paper. Roll up the towel, starting with a short side. Cool on a wire rack. In a mixing bowl, beat cream until it begins to thicken. Add sugar and coffee granules. Beat until stiff peaks form; chill. Unroll cooled cake; spread filling to within 1/2 inch of edges. Roll up again. Place on serving platter; chill. In a mixing bowl, beat frosting ingredients until smooth. Frost cake. Using a fork, make lines resembling tree bark. Yield: 12 servings. This may look like a lot of work, but it is not difficult to do and tastes wonderful. Hope you are recovering well from your surgery and that your family has a wonderful Christmas. Hi Lisa…You are constant source of inspiration! Thanks so much for sharing your talent. Dale and I hope that you and your family have an absolutely wonderful Christmas! Love your blog! I’m lucky that my husband does our cooking…so I’d have to ask him for his favorite recipe. Sorry. Thanks for always keeping us up to date on what is going on in your world. You are so sweet to do this, thank you! My favorite recipe is for Chocolate Chip Tea Cakes. They are shortbread type balls loaded with chocolate chips. My kids love them! I just finished making your reindeer mat the other day, it came out so cute! Have a great Christmas!!! Merry Christmas and Happy New Year to you and the entire staff….Hope you are feeling better each day. Really enjoy your shop and thanks for sharing your talent!!!. Really liked the Holiday Blog, fun to see what goes on in the rest of the country. The Gathering looks wonderful, can’t wait to come and spend a weekend!!! Merry Christmas! Thank you for all you do for us throughout the year. Your ideas are great and I love the wool! I have a great, easy snack to share. I don’t have a name for it, but it is very addicting. Mix all together in a bowl. Melt 1 pound of the white candy coating disks. Pour over the cereal/nut mixture, stir and put it on a cookie sheet, spread it out, let it dry and break it up. You won’t be able to leave it alone! Preheat oven to 350°F and line muffin pan. 1. Take unsalted butter and Guinness and let simmer in a small sauce pan. When mixture is simmering, add cocoa powder and whisk thoroughly. Turn off heat and allow mixture to cool. 2. In a separate bowl, combine flour, baking soda, salt, and sugar. Whisk. 3. In a large mixing bowl, combine egg and sour cream. Whisk until the consistency begins to look like cream. 4. Take Guinness mixture from fridge and combine into egg/sour cream mix bowl. Whisk. 5. Add your flour mix, and continue to whisk thoroughly. 6. Using a large spoon, scoop mix into lined muffin pan. Place in oven and allow to bake. 1. Bring heavy cream to a simmer in a small sauce pan. 2. Pour over bittersweet chocolate. Allow to sit for one minute, then whisk. Add in butter and continue to whisk until consistency becomes creamy. 3. Pipe filling into center of each cupcake. 1. Whisk butter. Add in a few tablespoons of powdered sugar at a time and continue to whisk butter. 2. Once all the sugar has been used up, add in Baileys and continue to whisk. If cream becomes too thin, add in a few more tablespoons of powdered sugar. 3. Pipe or spread butter cream over cupcakes and serve. Thank you so much for the chance to win one of your gifts. I love your blog and webstore & look forward to seeing you again in FL next year at the Feather Princesses Guild. One of my favorites is Hot Wassail; not only is it a great warm drink, it makes your house smell wonderful. Lisa, Yesterday I told you what cookies I am making for Christmas. Today I have been doing the baking and have my recipe ready to give you. I just read through all the ones in the comments and we have decided to make the pretzel, kiss candy too. 1. Heat oven to 400. Beat butter, 1/2 cup powdered sugar, and the vanilla in a large bowl. Stir in flour and salt. Stir in nuts. 2. Shape into 1-inch balls. Place on ungreased cookie sheet 2 inches apart. 3.Bake 8-9 minutes or until set but not brown. Immediately remove from cookie sheet and roll in additional powdered sugar. Cool completely on wire rack. Roll in powdered sugar again. I have ordered from your web site, Saw your booth in St. Cloud in June. Loved it. Of course I couldn’t go home empty. Love your books and everything you do with Wool :). Love your blog & looking forward to a shop hop with some friends to visit your shop. Melt one bag of white chocolate disks in micriwave. Unwrap & crush in food processor one box of candy canes. Pour crushed candy canes into melted chocolate & drop by teaspoonful onto waxed paper. Hope you are feeling better & have a very Merry Christmas! My favorite Christmas recipe is Sour Cream Coffee Cake, which we have every Christmas for breakfast. I like it quick and easy–lay pretzels on cookie sheet in single layer, top each with Rolo candy and put in 350 oven for 5 min (til Rolo’s get soft). Remove from oven and top each with pecan half. Let cool (if you can). These will be gone in a FLASH! Thanks for the giveaway and Merry Christmas!! Lisa, I am a big fan of your designs. I especially love the wool projects. Thanks for the Home for the Holidays blog pattern with the cracker jars. I had intended to make several of these and fill them with some homemade party mix. But I didn’t get that far. There is always next year. One of the recipes I make every year for Christmas is Snowflake Trash. Here is the recipe. Melt almond bark in bowl in microwave. Pour over other ingredients and mix thoroughly until will coated. Pour out on cookie sheets covered with wax paper and separate in thin layers. Chill and break into pieces to store. Stir together and pour on foil lined pan. So pretty for Christmas,not so sweet as fudges. Hint:If you can find red+green candy canes, it is more festive looking. Nuts,instead of candy canes are very good too. THANKS FOR SHARING NEAT FABRIC GIVEAWAYS! Merry Christmas to you, your family and staff! I hope everyone there is taking very good care of you and giving you all the pampering you deserve! We need you well and fully recovered so you will be ready to go at Road to California. Looking forward to seeing you in January. Thanks for the opportunity to win. Here’s wishing you, your staff and family a very Merry Christmas! Love your on-line shop and blog. Thanks for the opportunity to win something from you. Combine the cranberries, apple, brown sugar, orange zest, orange juice and 1 tsp. cinnamon in a medium bowl. Set aside. In the bowl of an electric mixer fitted with the paddle attachment, beat the eggs on medium-high speed for 2 minutes. With the mixer on medium, add 1 c. granulated sugar, butter, vanilla and sour cream and beat just until combined. On low speed, slowly add the flour and salt. Pour the fruit mixture evenly into a 10-inch glass pie plate. Pour the batter over the fruit, covering it completely. Combine the remaining 1 T. granulated sugar and remaining ⅛ tsp. cinnamon and sprinkle over the batter. Bake for 55 to 60 minutes, until a toothpick inserted in the middle of the cake comes out clean and the fruit is bubbling around the edges. Serve warm or at room temperature. Delicious served warm with French Vanilla ice cream. roll the dough into small balls. place a ball on each pretzel and bake. delicious combo of sweet and salty! What a great selection of recipes!!! I am going to enjoy browsing thru them. I also check your blog everyday….was in your shop last summer and can hardly wait to get back! Add the cooled choclate mixture. Pour into a 9 inch buttered pie pan. Bake 300 – 325 degrees for 40-45 minutes (may take longer). Middle will be moist, but cooked. This is an all-time favorite that we actually serve for any occassion and is perfect for when friends and family get together. Enjoy and Merry Christmas. Thank you! I use to make all kinds of Christmas cookies, but the favorite of young and old is still the Toll House Chocolate chip cookie recipe. So, I’ve given in and make that cookie and a peanut butter bar and they are all happy. Happy Holidays! Would love to win any of your prizes.. Ho Ho Ho! All these wonderful receipes you are going to have to make up a cookbook. Thanks for the opportunity to join in the fun and win prizes. I love the holidays. Besides being a time for family togetherness, we can enjoy the spinach dip, cheese roll and all the yummy treats we try to stay away from all year. Hope your holiday is wonderful. I have several recipes that we enjoy but I’m going to share a quick and easy sweet treat! pull cookie sheet out of the oven and add a pecan or walnut half to the top of each rolo candy pushing down. Allow to cool and enjoy! I always enjoy your blog. Now treats! Thanks. I found this recipe on a bag of cranberries about 20 years ago. It’s become my family’s favorite and has been requested by everyone who tries it. Mix and let stand in refrigerator for several hours. Fold gently. Chill until ready to serve. Chocolates are one of my favorites this time of year…Dark Chocolate, especially! 1/2 c Butter, scant 2 cups powdered sugar, one teaspoon vanilla and milk-a teaspoon at a time – mix and knead until smooth and creamy and will hold the shape of a flattened all. Chill, then dip into melted chocolate with salted, redskin peanuts. Cool on wax paper. Store covered. Lisa, First I am wishing you and your family the very Happiest of Holidays and good health in the coming year. I want to thank you for sharing your talent with the rest of us. I am always excited to see what you have to offer us on your blog or at a show. Start with either a round or square pretzel as the base. Top with a Rolo (by Hershey) piece of candy. Place in a 250 degree oven for about 5 minutes. Take out of the oven, and while the candy is still warm, press an M&M into the top. Place the treats in the fridge until cool (around 20 minutes?) before serving. My grandchildren love to make these but of course the adults love to eat them. I have enjoyed reading all of the great recipes. I have a favorite dip to share. It is good with vegetables and carckers or pretzel thins. Sure would be fun to win one fo your generous prizes. Lisa, Happy Holidays! I really enjoy your patterns. Here is a quick, simple and good recipe for cauliflower. Cook a whole head of cauliflower in the microwave, add a little water and cover with clear wrap, cook approx. 12 min. until tender. Drain water. Sprinkle with 2 cloves of garlic, then add 1/4 C olive oil, and 1/2 C parmesan cheese over cauliflower. I break the cauliflower up after the garlic, olive oil and parmesan are added to make it easier to serve. Lisa…Wisj=hing you and your family a happy and healthy holiday. Here is one of my favorite holiday recipes. It’s healthy too! Bring cauliflower and chicken broth to a boil in a large saucepan over high heat. Reduce heat to medium, cover, and simmer for 10 minutes. Uncover the saucepan and increase to medium-high heat. Allow cauliflower to simmer until soft and the cooking liquid has reduced by half, about 10 minutes. Remove cauliflower from heat and add butter, cheddar cheese and parmesan cheese. Mash with a potato masher until the cheeses have melted and the cauliflower is smooth. Add salt & pepper to taste. P.S. I love the necklace on the picture…where can I get one! We make chocolate covered peanuts too – but we use almond bark and chocolate chips with dry roasted peanuts. YUM – salt and sweet! Merry Christmas! One of our favorite treats for the holidays is Peanut Butter Balls. Mix together and refrigerate. When firm, roll into bite size balls. Melt 12 oz. bag of semi-sweet choc. chips with about 2 Tbsp. parafin. Cool slightly. Using a toothpick, dip peanut butter balls in chocolate, then place on wax paper. Swirl chocolate on top to cover holes. ( If peanut butter balls get to soft you may need to refrigerate again for awhile and if the chocolate gets to thick, reheat.) Refrigerate till served. I will be back after the holidays to read thru all these great recipes (don’t have time right now, busy, busy, getting last minute preparations done). This was a great idea Lisa! Wauw, first off all I hope you will feel a 100% again soon. Would be nice to win the aged muslin ;-), I’ve never won a a contest but you never know. Melt chocolate for 30 sec. in microwave, keep stirring every 10 secs. Beat sugar with butter, whisk the egga in one by one. Then the flour and a pinch off salt. Stirr the chocolate in very soft. Put it in the tins. Bake for 10 to 15 min. The inside shouls stay soft en melting. Serve with icecream and red fuit. Yammy..
Shame on me – I posted my entry in the wrong place! My favorite recipe is the pecan pie recipe on the Karo syrup bottle. Melt butter 3/4 stick, add white sugar 1 cup, flour 1 Tbsp, and karo syrup 1 cup – mix well. Add vanilla flavoring 1 tsp and 4 eggs – mix well. Then last, add pecans 2 cups. Bake purchased frozen pie crust 10 minutes at 350 degrees before putting the mixture into it. Pour mixture into prepared pie crust and bake for 1 hour until the middle is only slightly shaky (will get harder as cools). If the top looks like it is browning too much, then cover with foil. Thanks for sharing from your stash! Merry Christmas. 1. Preheat oven to 350 degrees F (175 degrees C). Grease a 9×13 inch baking dish. 2. In a blender or food processor, place artichoke hearts, Romano cheese, Parmesan cheese and garlic . Pulse until chopped, but not ground. Set aside. 3. In a medium bowl, mix together spinach, heavy cream, sour cream and mozzarella cheese. Stir in artichoke mixture. Spoon into prepared baking dish. 4. Bake in the preheated oven for 20 to 25 minutes, or until cheese is melted and bubbly. Merry Christmas to you & your family! LOVE your website & blog, thanks for the chance to win, altho I may be too late?! Hope you’re feeling better soon! I had the pleasure of meeting you @ prims of the Midwest & am really hoping to be able to visit your Retreat House this coming year ~ have to wit ’til it warms up a little, my blood is thinned out from living in Florida! Fav recipe is the egg/bacon/hashbrown casserole, since you can prepare it the night before, then pop in the oven while the gifts are being opened, & it’s ready when everyone’s done unwrapping! Life is good! Thanks for all you do. Merry Xmas to your family! There sure are some awesome recipes on here!! Sure glad that I popped in! Be especially blessed!! My favorite new holiday recipe came from the internet. I made some pretzel toffee and it is addicitng. I could eat the whole pan. Easy and quick to make. Also stocking up on the Bailey’s Vanilla Cinnamon. Great over ice cream! My new favorite recipe is for peanut butter fudge. So simple, smooth and good. Put both in microwaveable bowl. Microwave to melt and mix well. Pour into buttered 9″x9″x2″buttered pan. Let set a few minutes to set . Cut into squares and serve. Mmmmmmmm good.